Traditional Irish Soda Bread with a twist! Loaded with dark chocolate chunks and crunchy pecans! I wasn’t planning on posting a soda bread recipe this year. I already have this Rosemary Cheddar version and an awesome dried fruit soda bread here on the blog. But there are so many things you can do with a basic soda bread, that the temptation to make another one got the better of me. And I’m so glad I did! This one might be my most favorite yet. It’s seriously packed with chocolate chunks, not itty bitty chocolate chips I tell ya. This is important for the recipe because when you slice into the bread, the chunks of chocolate should still be melty and soft. 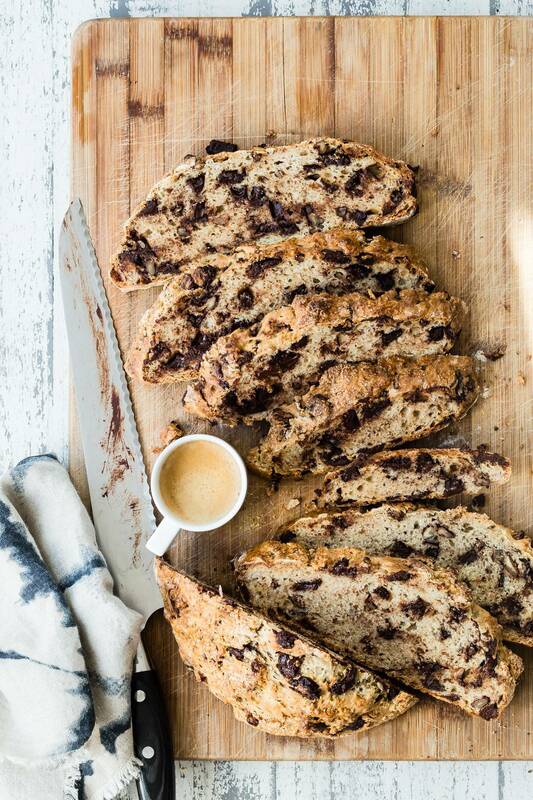 Imagine your ideal chocolate chip cookie in bread form. I used these dark chocolate chunks from Sharffen Berger, they’re a little pricier than a regular bag of chips but so worth it! You’ll find that this dough is a sticky one, but plenty of flour on your hands should be enough to help you mold the bread into a perfect ball. Make it the same day you plan on eating it as soda bread can get dry quickly. You can mix the dough and have the bread in the oven in about 20 minutes so it’s really easy to make. Make sure you have a sharp knife to make that cross on top. 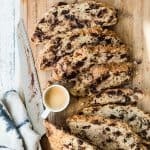 I love eating this soda bread with a generous spread of really good butter, the salty yellow stuff, but with so much chocolate in this one, you could almost add a dollop of whipped cream and call it a full-on dessert! This soda bread is amazing and loaded with chocolate chunks and crunchy pecans. 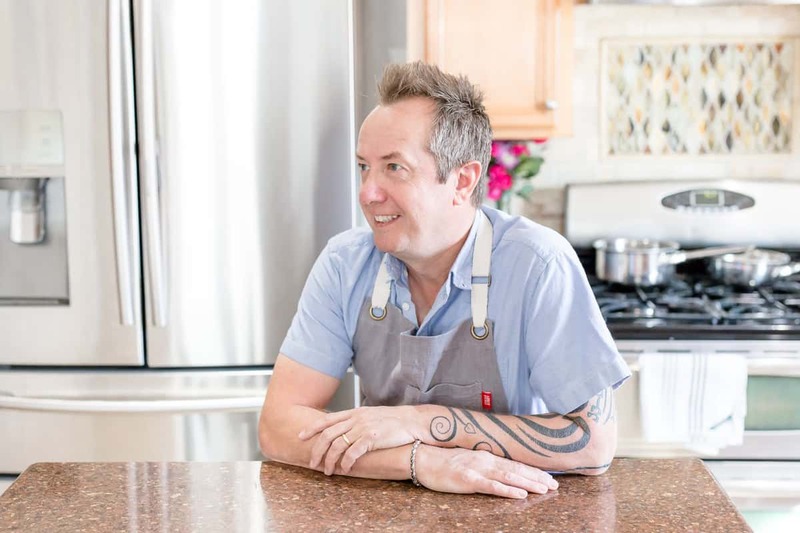 Preheat the oven to 425 degrees F and cover a baking sheet with parchment paper and a light dusting of flour. In a non stick pan, combine the pecans and brown sugar over a medium heat until the sugar has coated the pecans. Heat for about 5 minutes and then set aside to cool. in a bowl mix together the flour, baking soda and cream of tartar. In another bowl whisk together the buttermilk and the egg. Add the liquid to the flour and using your hands or a wooden spoon combine until all of the flour has been soaked up. Add the chocolate chunks and pecans and mix through. Gently form the dough into a ball using extra flour on your hands to prevent it sticking. Place the soda bread on the prepared baking sheet. Using a sharp serrated knife cut an X on the surface of the soda bread. Bake in the oven for about 40-45 minutes and the dough is golden brown on the surface and fully cooked all the way through. If the middle still feels a little soft give it another 5 minutes. Let cool for 30 minutes before slicing. The most awesome bread EVER! Have you ever toasted sod’s bread? Just curious as to how that would turn out? All the time Colleen but not it depends on the filling I added, this chocolate version could get messy. But all in all it always tastes great warmed up! Loving this classic recipe with such a simple twist! 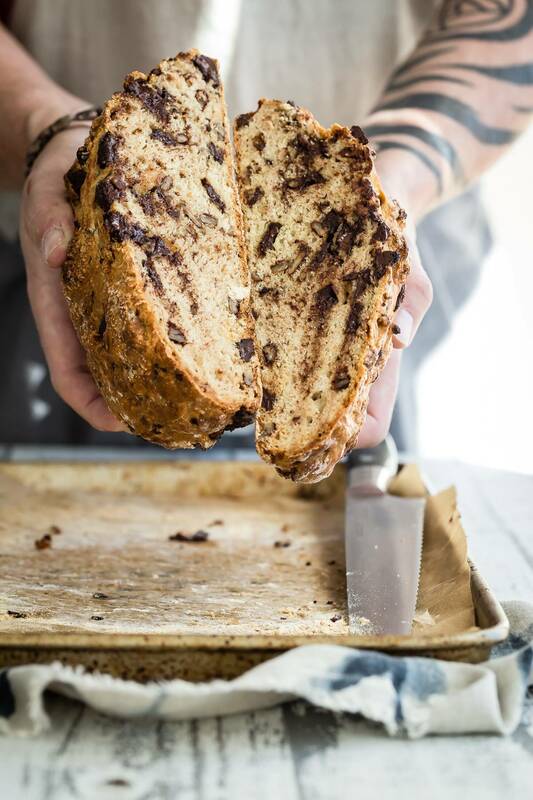 Bring on the chocolate, this is the perfect Irish soda bread! I am SO dreaming of this!!!!!! Those chocolate chunks sound AMAZING!